In 2017, ReVision Energy teamed up with Quest Renewables to bring the first solar canopy to Maine. 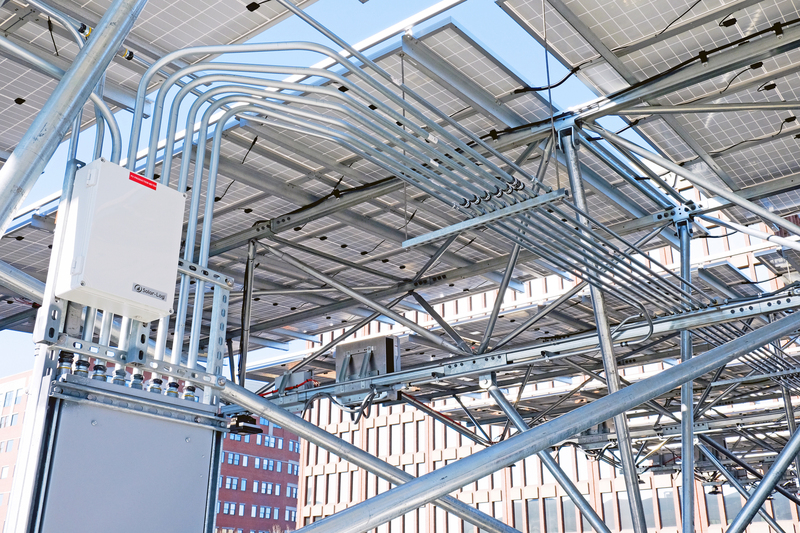 578 solar electric panels were affixed atop the Fore Street Garage in the historic Old Port district of Portland, sheltering cars and producing clean, renewable power for the adjacent Hyatt Place Hotel. The 193 kW system added to an existing 28.8 kW awning mounted system installed by ReVision at an earlier date. The Hyatt Place and Fore Street Garage are owned by East Brown Cow, local developers known for incorporating renewable energy into their energy-efficient buildings. We’ve had the pleasure of partnering with East Brown Cow on a number of commercial projects in the Greater Portland area. The advanced long span solar canopy is expected to generate roughly 232,235 kilowatt-hours of solar electricity every year, for the 25 year warrantied life of the panels and beyond, offsetting over 23% of the hotel’s electrical consumption. The green-­certified Hyatt Place further offsets their carbon footprint with LED lighting and electric car charging stations.